I’ve noticed many of my friends Facebook posts over the last few weeks urging people to speak out about mental illness. I’ve wrote about campaigns about mental illness before, but I felt I couldn’t let Suicide Prevention week go by without speaking out about it. I particularly wanted to speak about Teen suicide, one of the leading causes of death in that age group in the UK. It’s hard to imagine the extreme psychological pain that leads to someone deciding suicide is their only option. Teenagers have a lot to contend with, the world can at times be a harsh place. Bullying is rife within some of our schools, pressure to perform academically is great, being accepted and liked, is even greater and mental disorder can affect us all, at any time. Suicide is a tragedy and one teen death by suicide is one death too many. It is something I feel very, very strongly about. I worked with children who were suicidal when I ran the charity, A Way Out. Some of our work at the time, focused on trying to keep them alive. Sometimes this was around harm minimisation, like getting the child to hospital quickly after a suicide attempt or ensuring they were in safe and secure accommodation where any medicines and sharp objects were out of reach. Other times it was about getting to the root issues, being a safe place for children to come and open up about how they were feeling and ensuring they got the right medical support and treatment to deal with those feelings. It wasn’t easy. I remember at times really praying they would be safe and that they wouldn’t die. I know there are young adults here today that maybe wouldn’t be, if it hadn’t been for our work. That’s a good feeling, but then I think about all the thousands of other children across the UK who will be feeling like ending their lives and I know the battle is continuous. But what can we do? 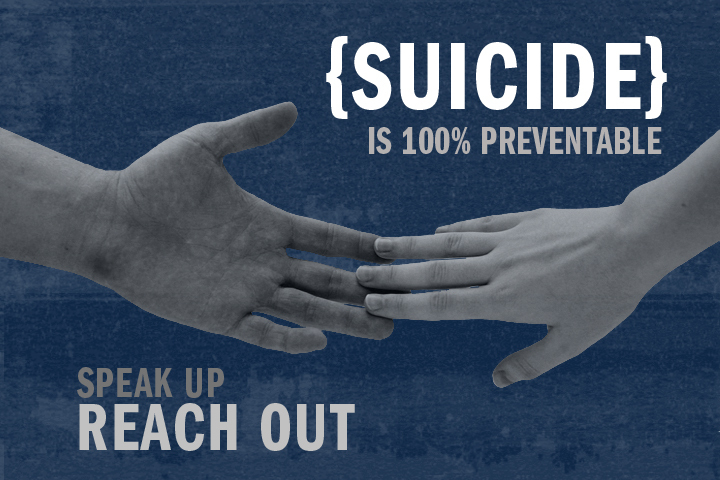 Well, the message of suicide prevention week was to “reach out”. Let’s look at how. Firstly, reaching out to those who are vulnerable to suicide, lonely people, a child or friend who is being bullied or maybe someone who you know is depressed? Reaching out as a friend, asking them if they are ok and letting them know you care, can have a significant impact, as can listening and just being there. Secondly, reaching out and connecting people to relevant services. Although support of friends and relatives is crucial, it’s not always enough. Often formal help is also needed. This maybe clinical, psychological or social. Make sure you link someone at risk to the specialist services that are available. Thirdly reach out to those who have been bereaved by suicide. Suicide is devastating for families and they may experience a whole range of emotions, including grief, anger, guilt, disbelief and self-blame. Offer them a non-judgmental ear and an opportunity to talk about their loss. It may be a starting point for them to move through their grief. Lastly, keep raising awareness, posting on Facebook and spreading the word. Suicide “is” preventable so let’s try and stand together to prevent other deaths in Teesside and beyond.